Garage door openers are tools which help to save the hassle of getting in and out of your vehicle, just to close the door. Despite it not being too much of a task, we still want to drive our car into the garage without any physical exertion. A garage door opener is convenient equipment to have which also provides you with additional security. You’ll be informed if the door isn’t properly closed thus reducing the chances of a robbery. A belt made of either steel-reinforced rubber, Kevlar polymer, fiberglass or polyurethane drives the trolley; opening the garage door. Such openers are quiet and operate smoothly. They can also lift oversized and heavy doors. While they hardly require maintenance, these are expensive. In such openers, a bike-style chain is looped around the rail that pulls the trolley. Such openers are durable, affordable, and can easily open old and oversized doors. You can even use such openers when there is no power. However, these are noisy and need periodic maintenance. As the name suggests, a long screw lifts the door. A threaded and long metal rotates moves the trolley along its track when it rotates. The good thing about such openers is that they are less noisy than chain-drive openers. Plus, these have fewer moving parts and are more durable too. While they are quite fast, such openers require lubrication to prevent wear. A stationary chain drives the motor along in such kinds of openers. Since there is one moving part only, the motor is reliable and extremely quiet. On the other hand, these are quite expensive, and you won’t find a lot of options on the market. Instead of being mounted on the garage’s ceiling, these openers are mounted on the wall. While these are extremely expensive, they are highly secure. The deadbolt mechanism of this opener locks the door when it is closed. Such openers allow plenty on-board computerization and are quite durable. However, it is noisy, requires frequent maintenance, and works only on sectional doors. The two most commonly used garage door openers are belt-drive and chain-drive openers. To save you the hassle of extensive research, we have listed the ten best garage door openers. We read what customers have to say about the openers so that making a choice is easier for you. It is durable, easy to install, and comes with commendable security features. 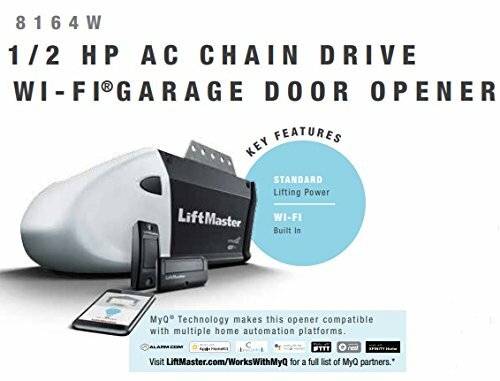 All in all, with this garage door opener, you are ensured reliable and effortless lifting performance. 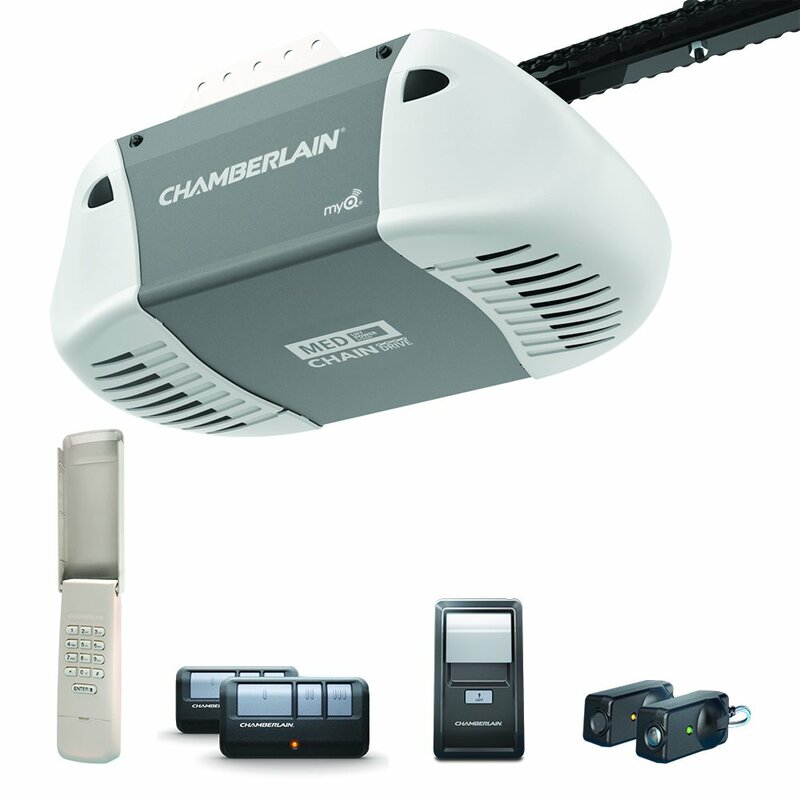 A reliable garage door opener, the C410 is easy to install and smoothly operating option. It is one of the best garage door openers and has commendable safety features. It is powered by Chamberlain’s lift power system, thus making the opener a long-lasting and durable option. The C410 has a high lifting capacity compared to many other ½ power class openers. The unit is designed for keeping security and safety in mind. It is equipped with security features like Posilock protection against forced entry and security+2.0 code encryption. Meanwhile, features like the enhanced TriBand frequency technology ensures superior performance and range. Other features also include a wireless exterior keypad and dual function wall control. 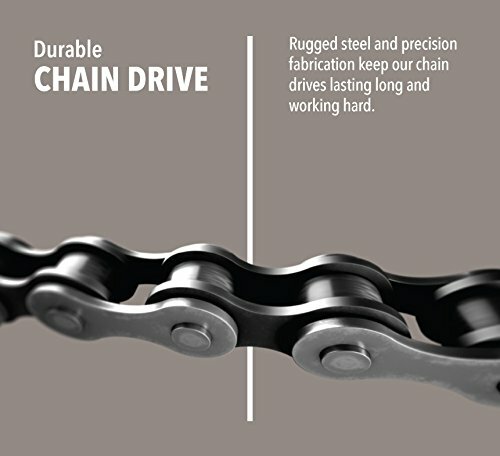 Chamberlain C410 is a durable chain drive that has rugged steel and precision fabrication. If you have a 7-feet garage door, then this is one of the best garage door openers you can get. The smart technology of this best garage door opener gives you more control. It also makes it easy to manage your home. The Chamberlain 450 is quite similar to the C410 mentioned above. The smart technology of this best garage door opener gives you more control. It also makes it easy to manage your home. Moreover, Chamberlain’s lift power system delivers a high lifting capacity. The built-in Wi-Fi feature lets you control the door with the company’s MyQ App. With the app, you can open, close, get real-time alerts, and know the door’s status. 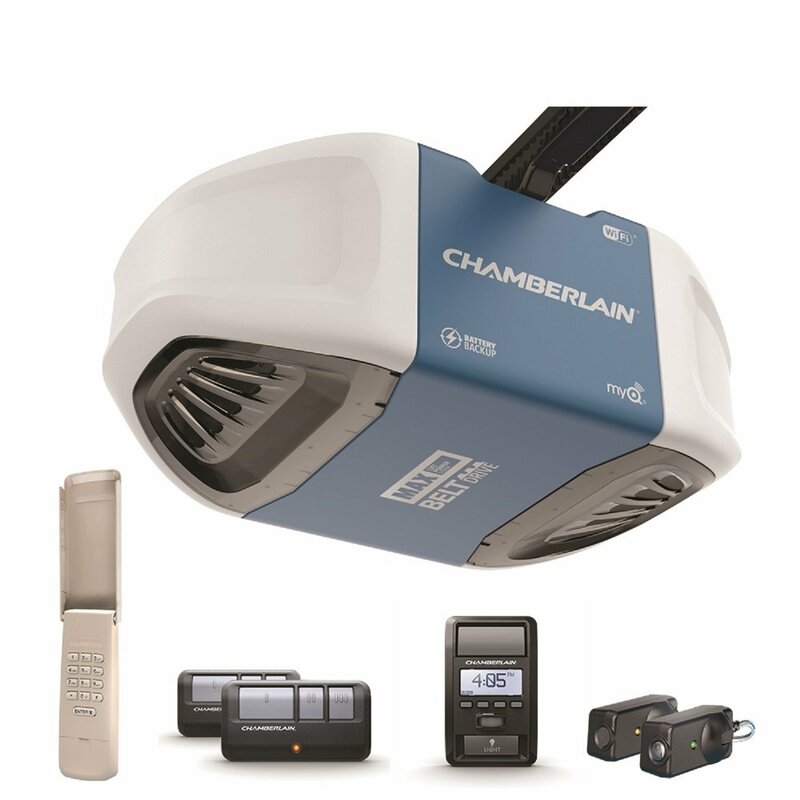 Chamberlain C450 is the highest quality garage door opener because it is built from high-grade materials. 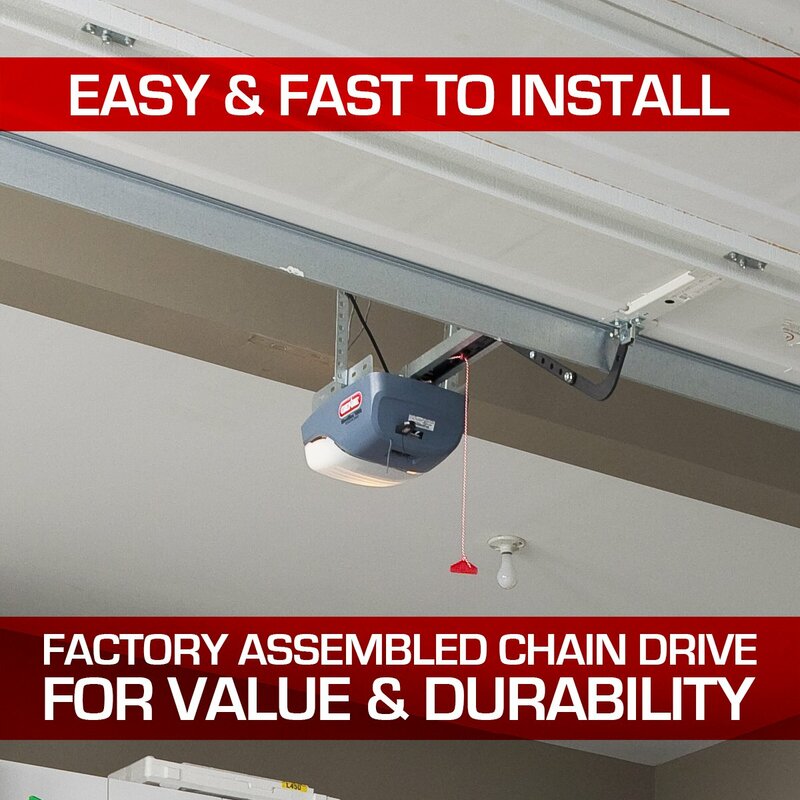 This garage door opener has been specifically designed for 7-feet garage doors. Since it offers a high lifting capacity, it is suitable for those that have a heavy garage door. Heavy doors include doors made of steel. Apart from being long-lasting, reliable, and dependable, the ChainMax is also affordable. It has a superior design which also ensures quiet operation. 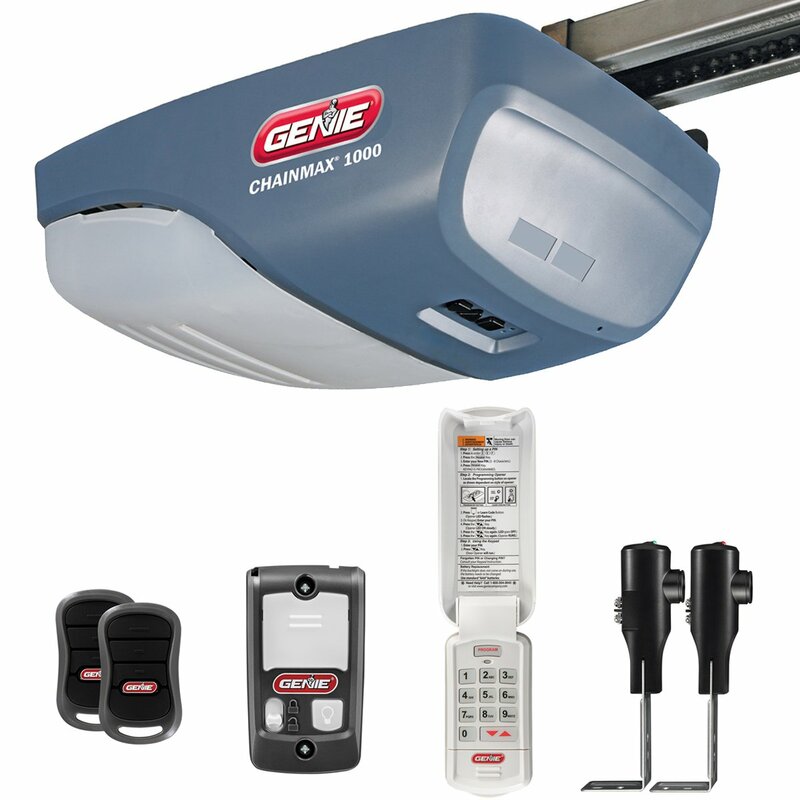 The best garage door opener for traditional chain drive operation is this one by Genie. Apart from being long-lasting, reliable, and dependable, the ChainMax is also affordable. It has a superior design which also ensures quiet operation. 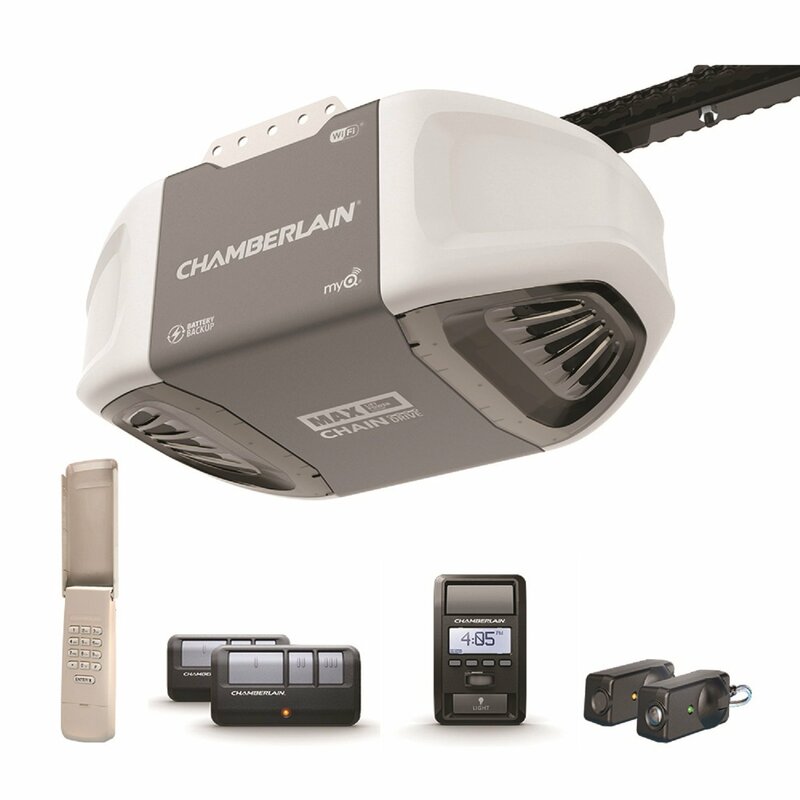 The ChainMax garage door opener is equipped with a powerful 140-volt DC motor that allows smoother door travel. It also comes with multiple accessories that allow ease of use. It also comes with many safety and security features. Genie ChainMax 1000 is easy and fast to install. The ChainMax 1000 is an ideal option for residential garage doors that have a height of up to 7 feet. It is best for those looking for a secure option that connects with HomeLink or Car2U. Engineered using smart technology, it makes it simple to manage your garage door. It is strong enough to withstand tough weather conditions. 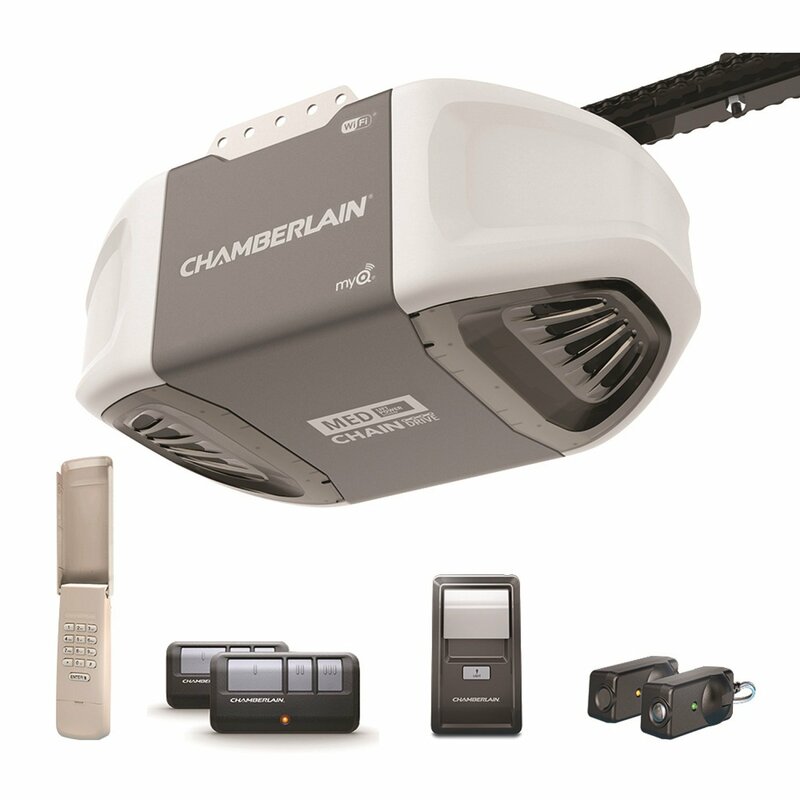 Yet another best garage door opener by Chamberlain, this unit is a highly durable unit. Engineered using smart technology, it makes it simple to manage your garage door. It is strong enough to withstand tough weather conditions. Plus, the precision engineering and anti-vibration technology ensure smooth performance and years of reliability. 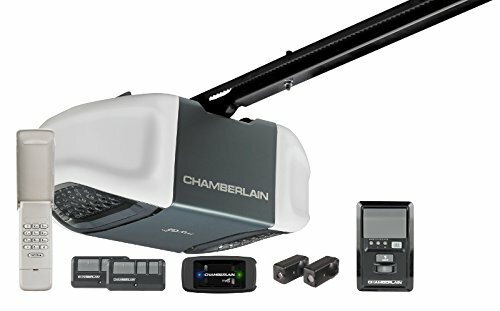 Like other Chamberlain models, this is also powered by the lift power system that provides the maximum lifting capacity in this category. The MyQ app and built-in Wi-Fi allow you to open, close, get real-time alerts and check the door’s status from anywhere. 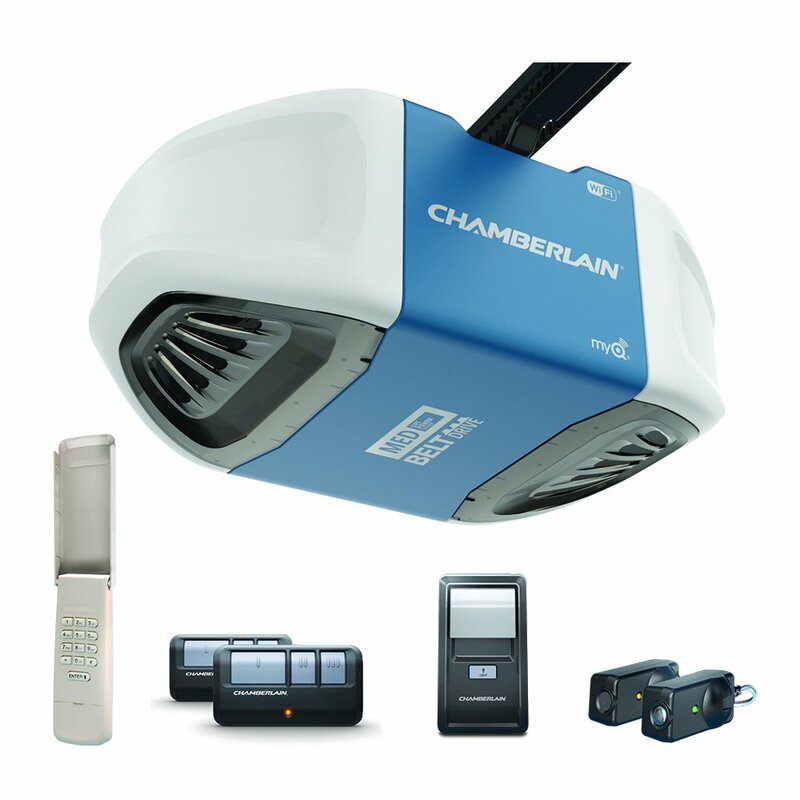 Chamberlain C870 supports battery backup that helps this device can work when the power is out. It is ideal for 7 feet garage doors. You can also use it for 8-feet and 10-feet doors with an extension kit. It is most suitable for areas with frequent power shortage as it comes with backup power. Moreover, If you have a heavy garage door, then the max lifting capacity of this door opener is ideal. It is designed, keeping in mind security and efficiency in mind. Moreover, the built-in Wi-Fi ensures easy connectivity. There are numerous features that compelled us to include this product in our list of best garage door openers. It is designed, keeping in mind security and efficiency in mind. Moreover, the built-in Wi-Fi ensures easy connectivity. With the MyQ mobile app, users can control the door and receive alerts from anywhere. There are numerous security features. The Security+2.0 sends a unique code with each remote click so that only you can open the door. Moreover, Posilock protects against a forced opening. Meanwhile, the alert-2-close sends a signal when MyQ is closing the door. The protector system’s invisible light beam reverse the door automatically in case of an obstruction. With the MyQ mobile app, users can control the door and receive alerts from anywhere. There are numerous security features. Like other best garage door openers in this list, this unit is also suitable for doors with a height of 7-feet. It is most suited for those looking to stay connected and control the entry and exit of their house regardless of where they are. Thanks to its Wi-Fi capability, it can be operated from anywhere. The B970 is fitted with an extra durable steel-reinforced technology. Apart from being extremely quiet, the unit also features smart-technology that make the door easy to manage. Like other models from the same company, the B970 also comes with the MyQ app. As a result, you can get real-time alerts and know all about your door from anywhere. Thanks to the anti-vibration technology, the garage ensures smooth and quiet performance. Moreover, the battery backup lets you use the opener without power. Chamberlain B970 is made from high-grade materials for years of reliability and smooth performance you can sleep through. 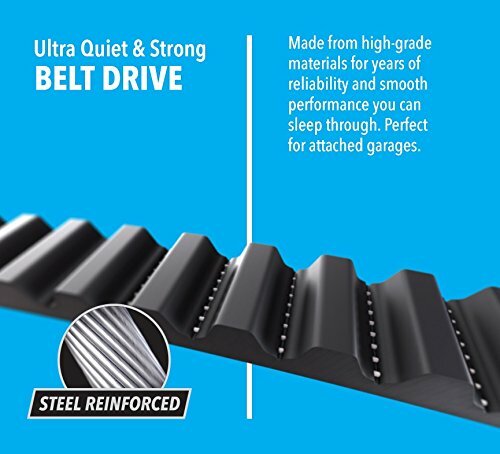 Due to the anti-vibration feature, this is the ideal option for those with attached garages. Moreover, like other Chamberlain products, it is suitable for door measuring 7-feet in height. This model too is a strong, durable, and quiet garage door opener. Smart technology along with steel-reinforced belt drive gives you more control. The B970 and B550 are quite similar in terms of functionality and application. This model too is a strong, durable, and quiet garage door opener. Smart technology along with steel-reinforced belt drive gives you more control. It is also precision-engineered thus ensuring reliability for years to come. It offers a smooth and quiet operation that you can sleep through easily. 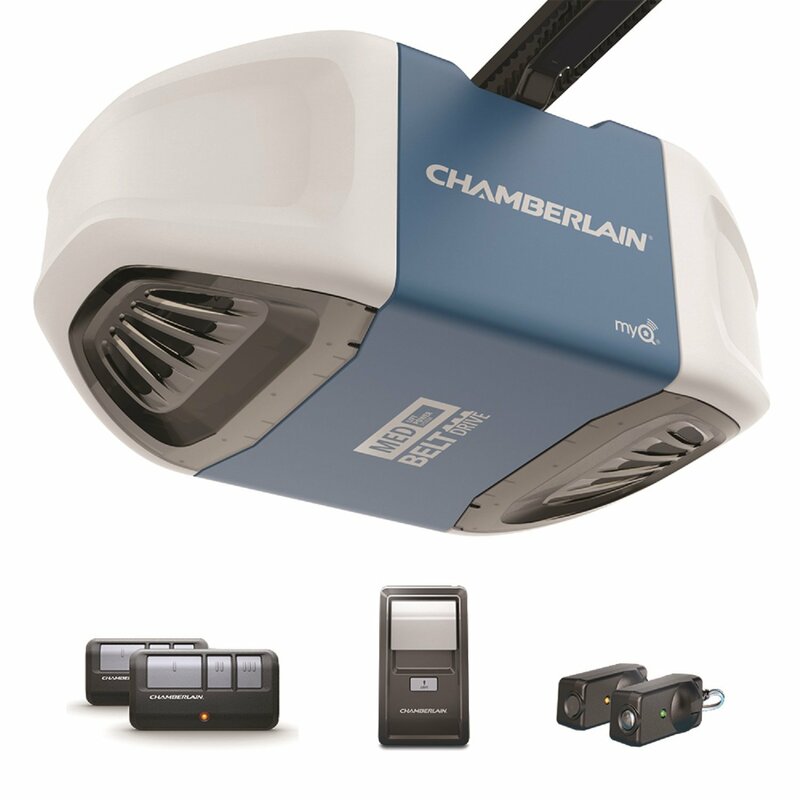 Like other Chamberlain models, the door opener provides a high lifting capacity. Similarly, Chamberlain MyQ app and built-in Wi-Fi give you control of your door from anywhere. Chamberlain B550 is strong and durable for reliable performance. People with shared or attached garages can find this to be the most suitable option. You can open or close your garage door without disturbing your neighbor with vibrations thanks to the anti-vibration technology. The B503 is powered by the MED lift power system that delivers a great lifting system. The efficient power allows reliable performance and effortless lifting. 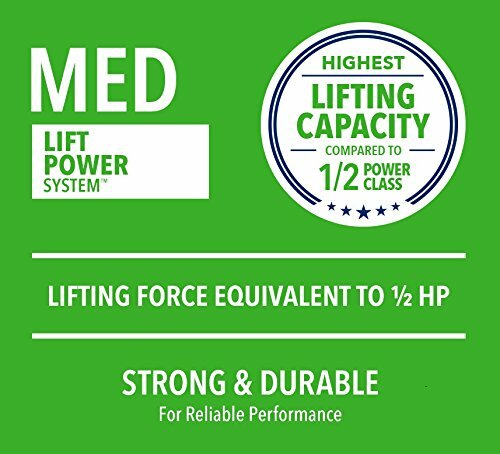 The B503 has the MED lift power system that delivers a great lifting system. The efficient power allows reliable performance and effortless lifting. Another great feature is the superior range. It has 2-3 button controls which allow you to control 3 openers. It also features exclusive Triband technology which can boost remote range up to 1,500 feet. As a result, you can enjoy quicker entry and exit. It also comes with numerous security features. The security+2.00 along with 100 billion code encryption keeps you safe from hacking. 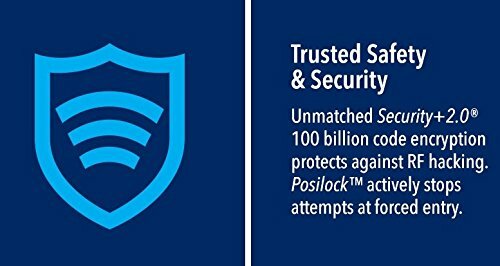 At the same time, Posilock ensures anti-theft protection. It is perfect for those that have a garage door measuring 7-feet in height. Ideal for those looking for a powerful yet silent option as to not disturb others. 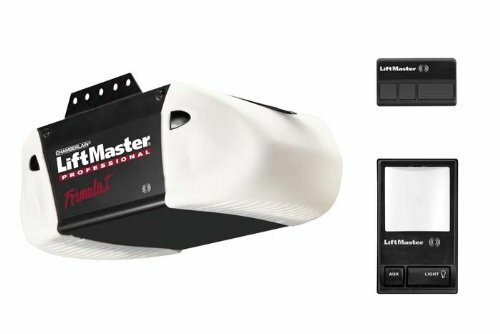 LiftMaster’s 0.5HP motor belt drive system offers reliable performance and smooth-running power each year. With the MyQ app, users can control and monitor the houselights and garage door with their device remotely. You can rely on this garage door opener to work for years to come! It is built for people with 7-feet garage doors. Furthermore, apart from being the ideal choice for high security, it is a suitable option for those looking to stay connected. The opener adds convenience with its timer-to-close function. So, if you forget to close the door, it will automatically close. The last product on our list of best garage door openers is the perfect blend between quiet and power. This ultimate blend is possible because of the 0.5 HP steel-reinforced belt drive. Another impressive feature is the motor vibration isolation system. Consequently, this eliminates powerhead vibration which in turn reduces noise. In addition, the opener also adds convenience with its timer-to-close function. So, if you forget to close the door, it will automatically close. Moreover, the MyQ technology lets you open, close, and monitor the door from anywhere only using your smartphone. 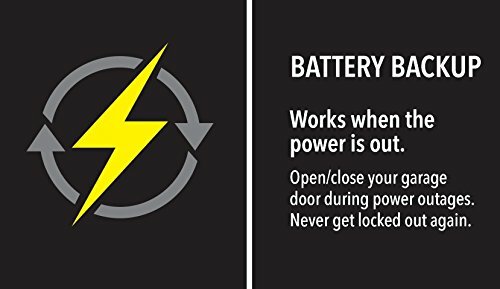 Chamberlain WD832KEVG fits garage doors up to 7ft. high. This garage door opener seems to be the best options if you have rooms above the garage. Since it is extremely quiet, it won’t disturb the residents overhead. Garage door openers come with either a DC or AC motor. AC motors are more reliable and affordable. Meanwhile, DC models don’t make a lot of noise and are smaller too. The lifting power refers to the horsepower needed to lift or close the door. The standard range of horsepower is 0.5 to 1.5 HP. On one end, 0.5 HP is sufficient for majority types of doors. However, it might not be able to lift doors made of solid wood. On the other hand, high-powered models are able to lift doors with less effort. Plus, with higher horsepower, opening and closing the door is quicker and smoother. With a home-automation system, you can control the garage door opener remotely. With this feature, you can connect your opener to a wireless network. Then, you can control it and check its status from anywhere you are. A dual frequency garage door opener lets the remote switch between two frequencies. This way, you can minimize interference if you live in a densely populated area. Make sure your chosen garage door opener has features that prevent it from suddenly falling on you. There are cases where the belt malfunctions and a 600-pound door might just fall on you! So, the garage door opener you choose should have commendable safety features.